"In The Way of the Tumbrils, a dozen of the most turbulent and tragic episodes of the French revolution are recounted. Part history, part guide book, The Way of the Tumbrils is a story of men and women fighting desperately to avoid the scaffold." When today's tourists see the darker side of Paris, including iPhone theft, a permanent trail of dog faeces, and the constant whiff in the air of surliness and cigarette smoke, it can be easy to forget the city's rich history and cast of memorable characters. Thankfully, John Elliot, in what is sadly his only book, is able to bring the whole fabulous story back to life in The Way of the Tumbrils. The writer is, by his own description, not really a writer at all, but just an ex-railwayman with an interest in his subject. However, these humble origins have begotten a text of greatness, which would make a superb gift for all history buffs and Paris fans. The tumbril, or tumbrel, was a two-wheeled cart often used at the time of the Revolution to transport goods and people. The reason for the tumbrils in Elliot's story, and indeed in its title, is predictably sinister and completely appropriate to the author's highly visual and sensory retelling of this time in history. Accessible and well-written, The Way of the Tumbrils mixes first-, second- and third-person, which contradicts all the stylists and goes against all the rules, and yet somehow works. Humorous stories arise from Elliot's lack of grasp of French, which seems even funnier given his level of interest in the country's history. However, other scenes indicate that the writer has a higher command of the language than he gives himself credit for. 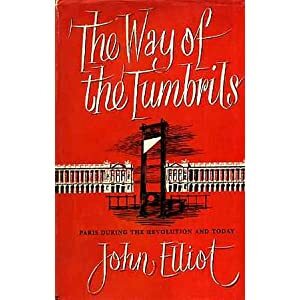 The overall result is a lively account of the bravery and treachery that pervades French history, and the fact that The Way of the Tumbrils only covers the Revolution is almost painful - Elliot is so engaging that a complete history of France would have been extremely desirable. In spite of the book being published in 1958, the routes set out by Elliot are still easily navigable today - although the inclusion of maps, at least in the e-book edition (the print editions perhaps have them) would have been even more helpful in this regard. There are also other formatting problems with the digital version: some accents and letters are missing or erroneous, and some images and captions are split across several pages. For this reason, the print version is recommended. The accompanying pictures, though, generally are reproduced beautifully. While the Bastille chapter lacks the same pace and humour as the rest of the book, the writer manages to keep the reader's attention throughout. Although a certain amount of knowledge is presupposed, this does not preclude understanding and may prompt the reader to find out more. Combining history, geography and tourism, The Way of the Tumbrils also considers questions of ethics: its at times emotive and highly descriptive nature may even go as far as to cause some readers to reconsider their views of the death penalty. If the object of history books is to enable the reader to imagine what it was like to be present at significant times in the past, Elliot certainly achieves this with The Way of the Tumbrils - and remarkably so considering his lack of status as a professional historian. Thanks to his work, many could even be ready to forgive Paris its mounds of mégots, and tour the place of the past today.